Flame up your bike's solid wheels with this awesome Skull & Flames Wheel Graphics kit. 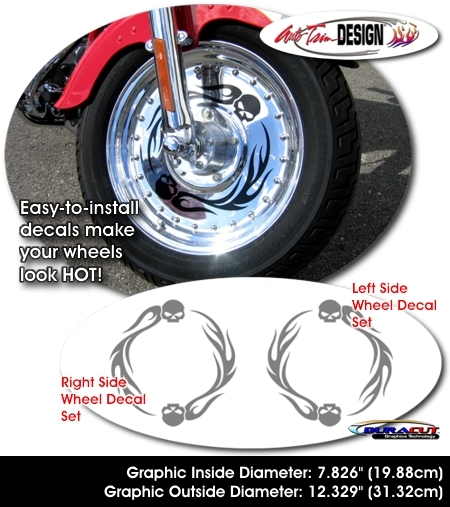 Easy-to-install graphic set comes complete with one (1) right side and one (1) left side graphic - designed so that the flames turn with the wheel's rotation. Available in a wide variety of colors, graphics will fit and install on just about any smooth solid wheel surface (shown on a 16" [40.64] rim - please verify your rim's application with dimensions noted in image). Includes easy-to-follow general online instructions. Set you bike apart from the rest today!